Bosch have held an annual media karting challenge for several years now. It is a highly anticipated event, and this year I entered my 15-year old son, Alex, in to represent the website on the condition that he writes about his experience. Yes, I know, kids and deadlines. But what I thought would be like pulling teeth turned out to be a several thousand word long article that I actually needed to trim! That's how excited he was. But then again, when you win your first race in only your first race, I guess I could let a thousand words slide. This wasn’t how a I expected this Friday to go. This wasn’t how I expected anything to go. But somehow there I was. P1 on the grid of the Bosch Media Karting challenge, slowly waiting for the checkered flag to go down. I was coming back from school after an incredibly long and tiring exam week; it was one of those weeks that makes your head spin out because of sheer stress. But it was sem-break now. School was over. I got home and sat down only to be immediately asked to go to the track because I was already running late. As soon as I got to the track I was put into a suit almost instantly and given a kart number. Apparently it was already practice. I managed to get a few laps in, although none were any good due to the multitude of karts on track. But I was happy, I mean what 15 year old wouldn’t want to blow off exam steam at the track. After qualifying we were grouped into teams based on qualifying times. My teammates were Fritz and Jeff; neither had driven a kart in their life. But from school to teammates in less than 6 hours, my day was shaping up pretty good––regardless of my teammates driving status. Apparently our team, platinum racing, had qualified first thanks to my one of teammates performance in his category. We sat there thinking up our strategy for our 1 hour endurance race, it may not seem like much but an hour in a kart is pretty heavy duty stuff. 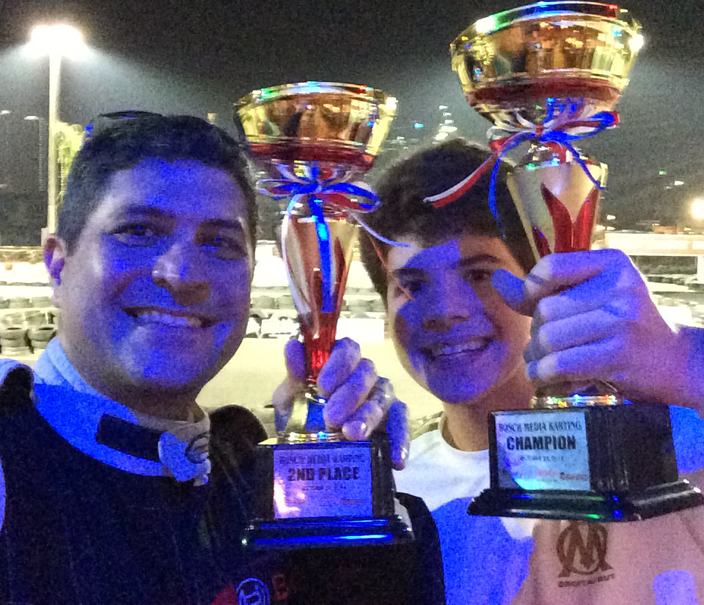 As my teammates had never driven a kart in their lives, I was given the captain/team manager role. The idea of soaking up the pressure like a golfer going in for that final putt knowing that it would win him the title excited me. It never had before that but today it lit a fire, something even I had never seen before. So there I was. First on the grid. Behind me were many experienced racers such as Mike Potenciano and many others. I was getting slightly nervous right at that point. What seemed like an eternity of 15 minutes of just siting on the grid, the race was finally ready to start. The owner of city kart, Jeff Freihuber, came out with the checkered flag, signifying that the race was already about to start. 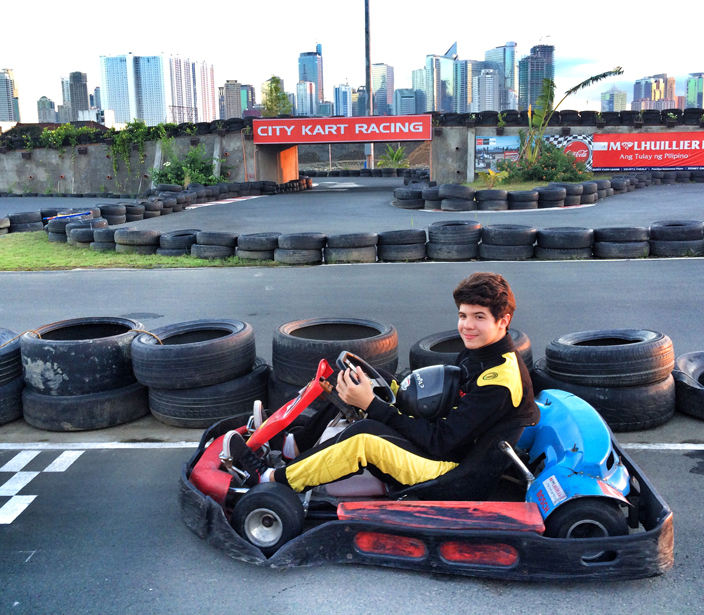 I could feel my kart was getting restless––it could sense a race was coming. The flag waived and it was go time. The first lap was fairly clean, I finished it in first with Mike Potenciano looming in the back for any opening. I used every trick I knew when I was defending, but when a guy is 3 seconds quicker than you, you know you’re going to have problems. That’s exactly what happened when I was finally passed. After all, it’s an endurance race. Not a sprint, I could let him go with minimal negative repercussions. I held 2nd place for around 4 or 5 laps when I was finally passed, by Ronald De Los Reyes. I tried to follow his lines for another 2 laps and I was almost able to pass him, but he pulled away. I stayed 3rd until the pit stops, and this is where things start to get a bit crazy. I swapped for Jeff, and everything was good. Then cars started flying of the circuit like thieves being chased by the police. Amazingly Jeff wasn’t one of those people and he held it clean setting extremely good laps for someone who considered himself not good. If he was our slowest driver he was very quick. We got through the rest of the stops pretty well. Every driver has to drive at least twice completing 5 laps at a time. Then all of a sudden Fritz started to blitz the field, I was absolutely stunned that for someone who has never driven a kart in his life was able to do a 1:08 around that track. And considering that the best times were 1:05, that’s some serious talent right there. When I looked at the live timing computer I read ‘1. Platinum’, I was shocked. We didn’t have a guy who could get the quickest time over a lap, but apparently, we had the team that could get the fastest out of the race. And that’s what matters right? Scarily, I was due to drive the final 15 minutes. Fritz came in and I quickly hooped in. Suddenly it was like everything stopped. The car felt fantastic; the best I had driven. Every lap felt amazing. Then I started to look behind. Catching me was my dad. I started to quickly do the math as I drove, slightly ironic considering the fact that my day started out with a big rant about math. Doing the numbers it seemed like he would catch me by the last lap. It was earlier, we started dueling in the second to last lap, slowly trading blows, I was unfairly hit off in clear view of the marshals and was rightfully given the place back. As we were fighting, Mike Potenciano found himself in this battle and we ended up 3 wide in the final corner, crossing the line just inches apart. It was thrilling, the best racing I’ve ever experienced bar none. I’ll never forget it. I had won my first trophy in only my second race. I think it might actually be the first trophy I’ve ever won in my life. Getting out of my kart and celebrating with Jeff and Fritz, getting the cheers, and pats on my back. I could have never imagined. Especially the feeling of the podium, getting called to the top step and celebrating with a trophy. Wow. Just wow. To think it all started with a stressful day at school. Oh, how 12 hours can change a life forever. I’d like to thank Bosch for organizing this great event that fits so well with their products and values. 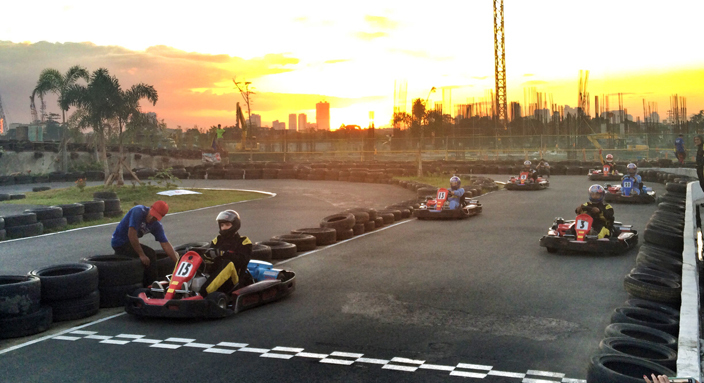 Because just like Bosch, Karting offers both speed and performance. Well that was my day. What a day it was! «Should we ban private cars from EDSA during peak times?